According to the U.S. Consumer Product Safety Commission report, there are approximately 10,000 annual residential fire losses in which the source of the fire is in the clothes dryer or vent. Dryers are the third most common type of equipment involved in fires, ranking behind stoves and fixed area heaters. 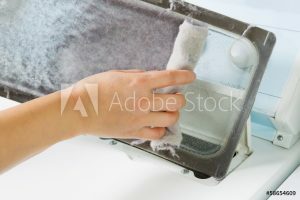 Clothes dryers can catch fire due to excessive lint build-up in the exhaust pipe or inside the dryer; this lint build-up is often out-of-sight. As a result, you should take the following steps to reduce the chance of having a dryer fire in your home.